A "state actor" has cut off internet access for Julian Assange, the founder of WikiLeaks, the transparency activist organization said Monday. Assange's internet link has been "intentionally severed by a state party," WikiLeaks said in a Monday morning tweet. "We have activated the appropriate contingency plans," the organization added. In recent days, WikiLeaks has published thousands of leaked emails from the account of John Podesta, chairman of U.S. presidential candidate Hillary Clinton's campaign. 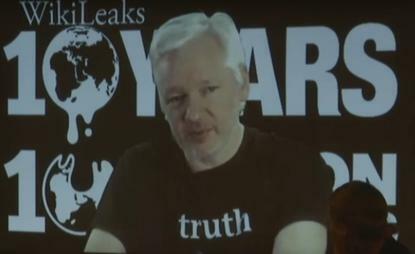 Clinton's campaign, along with President Barack Obama's administration, have accused WikiLeaks of cooperating with Russian hackers in an effort to raise questions about the legitimacy of the upcoming U.S. presidential election. WikiLeaks didn't provide evidence of the outage or state-sponsored involvement, and it didn't name the state actor it suspects. The group's press team didn't immediately return a message seeking comment on the internet outage. Assange has resided in the Ecuadorean embassy in London since 2012 in an effort to avoid extradition on sexual assault allegations.